We believe that light is more than just a basic need, it is a living substance that helps us to express new ideas and explore new emotions. It makes sense of the past, it brightens our present, and it lends brilliance to the future. We align ourselves with the masters of design. From the legends to the new talents, we are proud to work with artists who are tuned into the cultural conversation, who look to better their work by making it as sustainable as it is beautiful, and who demand nothing less than excellence—from themselves and those around them. We believe that provocation is a necessary element of evolution. We embrace the revolutionary spirits of our designers—we encourage them to seek out new poetic notions of functionality while staying ahead of the latest technological advancements. We believe in experimentation. It is how we have discovered some of the most influential and iconic elements of our work. No effort is ever wasted. We trust our intuition. We have confidence in our work and the work of our partners. We have fun. We offer pieces that are serious about their sense of playfulness and irony. We know our place. 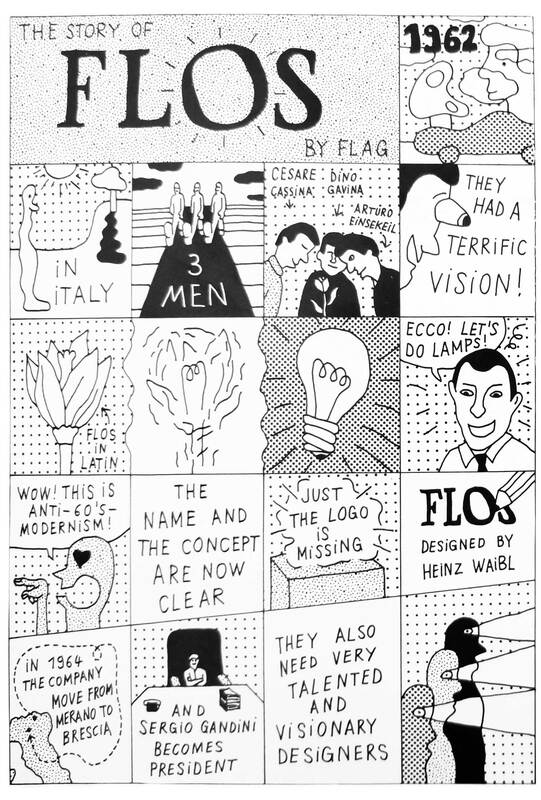 FLOS stands at the meeting point of art and design, of craftsmanship and industry, of limited editions and large scale manufacturing, and of the individual and the collective imagination. It is a unique space, and it is where we work best. Our FLOSOPHY is the undercurrent that informs all of our work. It is what defines us—and what sets us apart.